Ken McCoy, born May 18, 1932, passed away August 4, 2018. He was 86. Ken grew up in the Conroe Church of God (Seventh Day) and attended Midwest Bible College in Stanberry, Missouri, where he met his wife, Gladys. They worked together at the Church’s publishing house, then moved to Oregon, where Kathy and Jody were born. In Oregon, Ken worked at a sawmill but soon moved with his family back to his hometown of Conroe. There he continued attending the Conroe church and worked as a draftsman for Sparkler Filters until he retired. 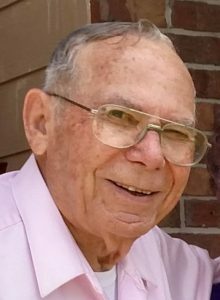 Ken loved his family, his church family and friends, old cars, semi trucks, building model trucks, fishing, and watching old western TV shows. He also enjoyed his ministry of sending cards to people and reading his Bible every night. Throughout his life, Ken could be found holding his wife’s hand, the wife of 63 years who faithfully loved him and helped him through his many health challenges. Ken is survived by his wife, daughter Kathy O’Banion (Dennis), son Jody (girlfriend Pamela Hill); brothers Joel (Teresa) and John (“Mickey”); grandchildren and great-grandchildren Jaclynn O’Banion (son Ty), Kelsi Chesney (Daniel) and their children, Jeremiah and Malory; and Kevin O’Banion, with son Kenneth. Ken is preceded in death by his parents Arnold and Virginia McCoy and Mickey’s wife, Verna.